If you’re kicking it in your local hobby shop today, well, we appreciate and applaud you. And if you are, there’s a good chance you’re kicking it there so you can take in one of Panini America’s two new products that released today — either 2018 Obsidian Football or 2018 Treble Soccer. We’ve brought you up to speed on the former over the last few days here on The Knight’s Lance. The latter was on display extensively in yesterday’s Quality Control Gallery. But in honor of 2018 Treble Soccer’s official release, we’re taking you straight to the box level with the following Teaser Gallery that showcases four boxes of the product. On average, each three-pack hobby box (five cards per pack) delivers three hits: One autograph, one autograph-memorabilia card and one additional autograph or memorabilia card. In addition, each box also delivers, on average, three vibrantly colored and micro-etched parallels numbered to 75 or less. Enjoy the break and stay tuned for additional coverage. 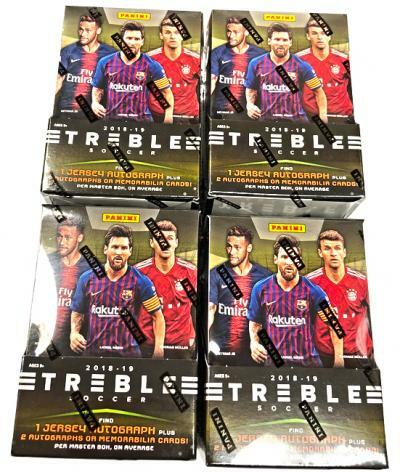 2018 Treble Soccer is available now at the official online store of Panini America.